Introduction: I first found out about the company Yoyofreaks on Instagram (of course). I was very interested in their “Your Mom” yoyo, but I was unable to pick one up; so when I found out that they were making an undersized bimetal yoyo with some amazing colorways, I just knew I had to pick one up. I’m not usually one for undersized throws, but for some reason this one really intrigued me. At $77 it wasn’t cheap, but I really wanted to add it to my collection. I was certain that it would not play like anything that I had thrown before. Packaging: The packaging for the Hashtag was a neat little plastic canister. The yoyo was well protected inside with cotton on either end to prevent it from moving around, and the lid makes a very pleasing noise when you pop it open (Idk, I just like it :D) I was pleased with the packaging, good job Yoyofreaks. Response and Bearing: The bearing that this yoyo has appears to be a center trac bearing. I know that some people really don’t like these, but I’m actually pretty pleased with their performance. I don’t usually have a problem with them being noisy, and they provide impressive spin times. I find their performance to be superior to other flat bearings that I’ve had like the old spec bearings. The response is just the regular white cbc response pad. These provide good, tight binds (injections aren’t too shabby either), and they last for a fairly long time. All in all, it seems like you freaks went with a standard, but very solid response and bearing for the Hashtag. Look/construction: The first thing that I noticed when I took this yoyo out of its packaging was how small it was. Its diameter is slightly smaller than the popstar. Now, I wasn’t put off by this (I was expecting it) but some people might feel like they are not getting very much for their $77. I didn’t feel like that at all, but I just wanted to throw that possibility out there. If the yoyo plays well, honestly, I’m not too picky about the specs. The second thing that I noticed was the shape. The width is almost as big as the diameter. Interesting……The shape itself is organic, with thick, curved rims, and then a step down about halfway to the bearing, and then a smooth curve all the way to the bearing. The stainless steel rims are inside the wall of the yoyo, but there is also another wall of aluminum between the cup and the stainless steel, so the the weight rims are surrounded on three sides by aluminum. I hadn’t seen many yoyos like this, and I actually quite like it. It allows both palm and talon grinds to be executed well. The cup slants down at the face to a small divot that allows for very good fingerspins. I especially love this trick, so this was a major plus in my opinion. The anodization is amazing. I love the rainbow fade and black colors all around the cup and rims. The finish is solid for grinds as well. It is a fairly light blast that allows for fairly long finger/arm/plam grinds. Overall, I really like the look and finish/construction (especially the placement of the weight rings), and was really interested to see how it plays. How it plays: In short, very surprisingly good. When I threw it down, I could immediately feel the power that the Hashtag brings to the table. It more than makes up for it’s small size with the weighty stainless steel rims. These rims are what takes a yoyo that would perform about as well as a popstar, and turns it into something that performs unlike anything else I’ve thrown. This little yoyo gives all my full size yoyos a run for their money in nearly all areas. It is rock-stable, long spinning, and can even handle horizontal play! I often find myself hitting (or trying to hit) a stressful speed combo (or something of that sort), looking down, and being absolutely amazed that I’m throwing a yoyo with a diameter smaller than a popstar! It just seems like there is nothing that the Hashtag does not excel at. The shape is unique, but the performance is just as good as some top of the line full size metals. 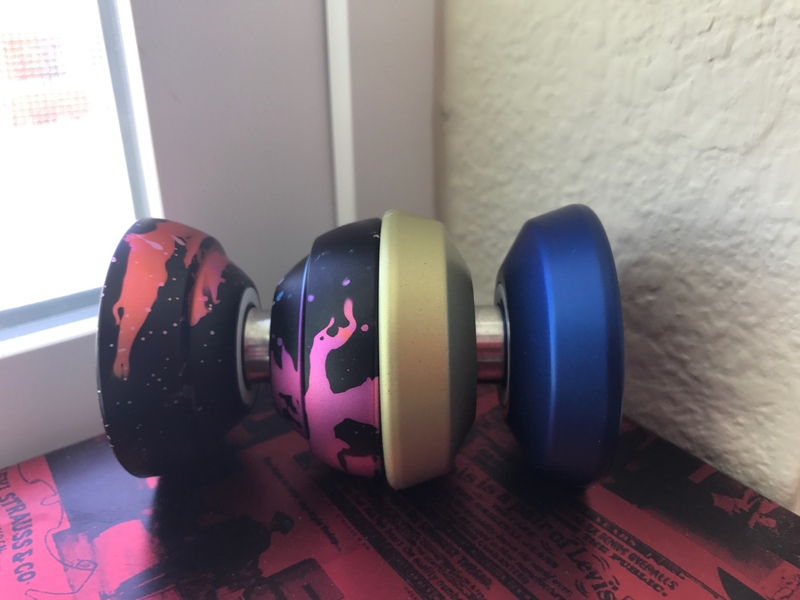 Conclusion/Why I wrote this review: Even though this yoyo is sold out at its retailer, I still decided to make this review. 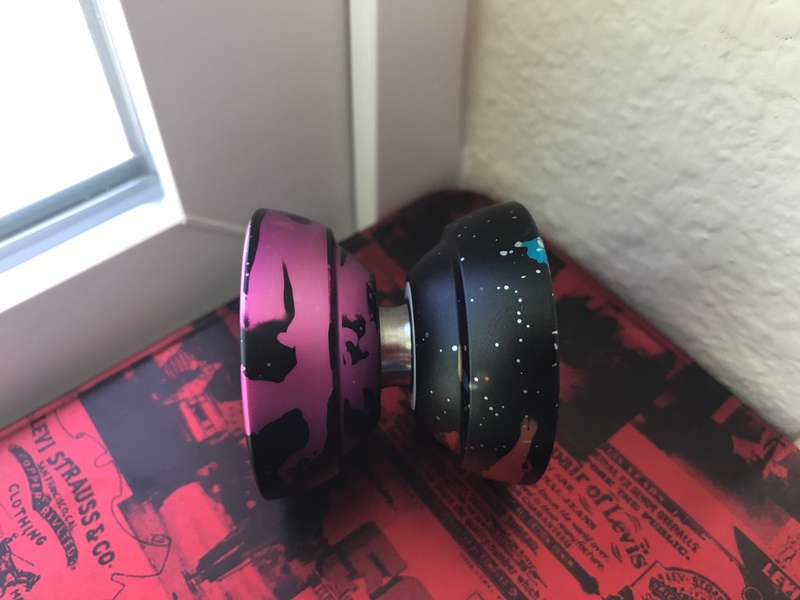 This is because I have seen Yoyofreak’s previous yoyo (the “Your Mom”) pop up on the buy sell trade multiple times, and I am sure that a few Hashtags will pop up as well. I wrote this review to tell you that IF YOU SEE A HASHTAG FOR SALE, BUY IT. Don’t think twice, just do it. It brings a unique feel and incredible performance. It is just a yoyo that must be thrown to be believed. 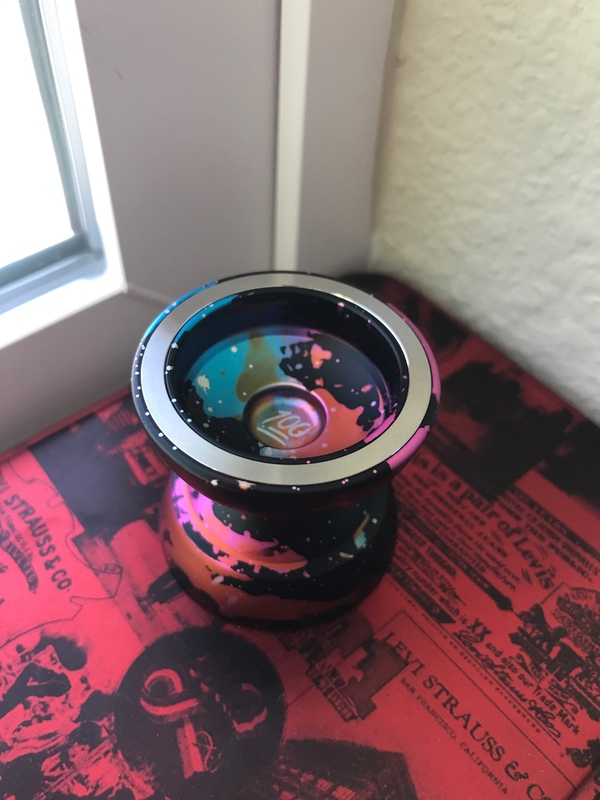 All I can say is, Great Job Yoyofreaks! I can’t wait to get my hands on their next release. Good review nightshadow! I was wondering if anyone was ever going to mention this throw! I know they only made 100 of them (all colorways combined) and they sold out VERY quick…I hope they make some more so enough people can try them. Thanks man! I haven’t tried that masamini, but I sure hope some other undersized Bimetals are made soon. I’m hooked! The # is an amazing little throw, nice and wide too! I got the Laffy Taffy colorway. I had played a prototype a month back at a contest and was impressed…I knew that next month up to release date was gonna be a long one. Nice review! I too got the PopRocks colorway. I love it dearly. Can hardly feel it in your pocket! Hi, I was wondering if you still had this throw and would be interested in selling it. Hope you can get back to me soon and have a great day. Hey, unfortunately I no longer have this yoyo. I sold it a while ago. Sorry about that!